Joel Pogodzinski was no stranger to Marquette University when he landed a job as its chief financial officer in September 2017. Not only is he a 1994 graduate of the College of Business Administration, he was a member of the 1993–94 men’s basketball team. That squad, led by Coach Kevin O’Neill, went on to beat Kentucky in the NCAA Tournament to reach the Sweet 16. President Michael R. Lovell in October named Joel the university’s new senior vice president and chief operating officer, putting him at the helm of many of the university’s operational units. As he settles into his new role, Joel took a moment to sit down with Marquette Today to talk a little about his family, an upcoming golf bucket-list item and how he went from pick-up hoops to the Sweet 16. Hometown: I’m from West Allis and attended Pius XI High School and Marquette University. Family: I currently live in Menomonee Falls with Michelle and our two daughters, Rachel and Katie. Rachel is a sophomore here at Marquette. Hobbies and interests: Other than Marquette basketball, the Milwaukee Brewers are at the top of my list. I’m also a huge golf fan. I love the influx of new players. I can’t wait to go to The Masters in April. I also spend a lot of time with my daughter Katie’s club volleyball team, so I’m a volleyball fan in general. It’s been great to watch our women’s team this season. I also enjoy seeing musicals with Rachel and spending time with family in general. Heroes: My parents. Growing up in a very modest, blue-collar family, my father was an electrician and my mom, a homemaker. They sacrificed so much for my siblings and me to receive a private education, for which I am most grateful. Favorite vacation spots: We have been frequent visitors to Orlando. Now that my daughters are older, we enjoy the Caribbean. 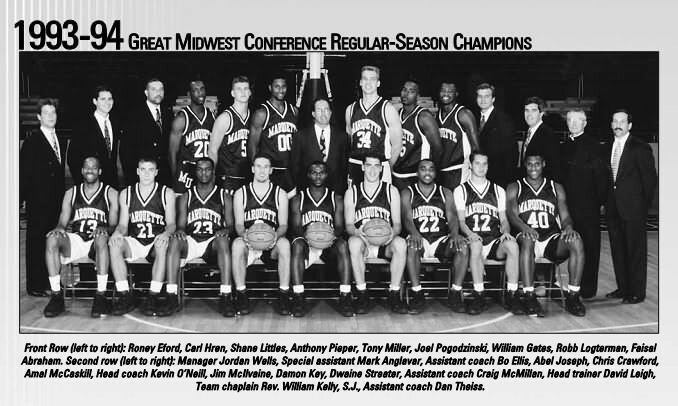 Fun facts: I played on the Marquette men’s basketball team my senior year of college under Coach Kevin O’Neill. In the summer before my senior year, I was playing pick-up games on the center court at the Rec Center. Some of the coaches from the men’s team came over and started playing against us. I was matched up with Assistant Coach Craig McMillen. After my team won, he asked if I would play with the team in the Old Gym for practice over the summer. Of course I said yes, and by the end of the summer they offered me a place on the team. We went to the NCAA Tournament that year (1993–94), beating Kentucky to make it to the Sweet 16. Want to learn more about Marquette’s new senior VP and COO and see what he’s up to? Joel is on Twitter as @JPogo32 — give him a follow!